Roving Maori chef Pete Peeti finds himself on Rakiura/Stewart Island in this instalment of his long-running te reo based cooking series. The area has kai moana in abundance, but Peeti is interested only in the rich orange flesh of the salmon. 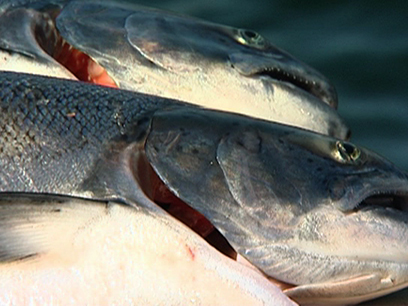 Following an entree of cream cheese and smoked salmon pate, the episode’s main course is a tour of the offshore sea-cage salmon farm at Big Glory Bay. It stocks 900,000 Chinook or King salmon — less one, which features in a Thai curry (with a side dish of sashimi) prepared for Peeti by the farm’s supervisor. Before Gibson Group TV series Duggan there were two telefeatures: Duggan - Death in Paradise, and Duggan - Sins of the Father. 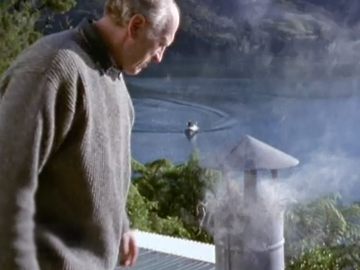 This first telefilm murder mystery introduces New Zealand's answer to Inspector Morse; troubled and brooding Detective Inspector Duggan (John Bach, from Close to Home and The Lost Tribe) who has taken leave from the police, and headed to his bach in the Marlborough Sounds. In this excerpt, a reluctant Duggan is persuaded to investigate when police fish a woman's body out of the water at a local salmon farm.